NEW! S.A.N.E. Solutions for Challenging Dog Behavior is now available as an online, on-demand course... click here for a preview or here for registration information. Note: This article is a summary of the concepts and exercises presented in the S.A.N.E. Solutions for Challenging Dog Behavior® Seminar. ​Dealing with fearful, reactive, or aggressive dog behavior is certainly challenging and often a topic of heated debate. A snarling, lunging dog at the end of a leash can be intimidating and downright dangerous. Unfortunately, human reactions often worsen the problem, as do training and handling techniques that only serve to intensify the dog's fear and anxiety. With the increase in "dangerous dog laws" and the number of dogs labeled as "aggressive" surrendered to shelters, effective and respectful solutions to this problem are essential. ​Allow the dog to have enough space. Space is the single most important factor to averting any reactive behavior and helping a dog feel safe! By paying very close attention to the dog's signals, we can quickly figure out where the spatial zone of comfort is for any particular dog. This allows us to start the process of slowly introducing another dog in the safe, systematic process described below. Often this is easier to accomplish in an outdoor setting, which allows for greater distance between dogs if needed. The Reactivity Reduction ExerciseWe want to set the dog up to be successful. This means that we will do everything we can to create a situation that allows the dog to feel safe and does not illicit a fearful or aggressive reaction. Remember, adequate spacing will be the crucial factor. It is important to allow the fearful dog to look at the other dog. We all know that if something is scary, we want to know what it is doing and where it is! Allowing the dog to look for a few seconds can relieve his anxiety, however if the dog continues to stare or get aroused, then simply ask the dog to avert his eyes with a soft signal on the head halter. Moving or changing direction can also engage the dog's attention again. Always stop the exercise when you hear that little voice in your head saying, "Wow this is really going well. Maybe we should let the dogs greet one another." I say this with a little humor, but seriously, it is important to stop with success and not try to push too far. It is also not critical that the dogs greet one another, and I rarely do this within the training session. You may also introduce a second dog and begin the process again as the next step in the progression. In addition to helping a fearful dog feel more confident in the presence of other dogs, I have used this exercise to introduce bicycles, skateboards, horses, and even men wearing funny hats! One Last ConsiderationWhile this approach is a positive and effective method to help dogs develop confidence and better coping skills, any dog that has exhibited extreme reactive behavior or has a bite history is always a management risk. It is important that people understand this responsibility and recognize the commitment involved in working with a dog with these issues. Understanding how posture relates to and directly influences behaviour in animals can give you valuable information about how and why your dog reacts the way he does in certain situations. 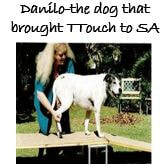 ​TTouch can be a great help in making cutting toenails easier and safer for both cats and dogs.